(P2) That’s true, of course. It’s also true, as Regis notes, that Mars itself is INHOSPITABLE: Cold and dry. In recent years we’ve discovered that Mars has more water than we once thought, but it is still not much water. There’s oxygen, too, but it’s not freely available in the atmosphere; you have to EXTRACT it. (P3) Regis writes in response to a number of recent PROPOSALS — most notably from tech-adventurer Elon Musk — to colonize Mars anyway. Musk isn’t the first to make such plans. But he has unique CREDENTIALS: He’s a very smart guy, he’s a very rich guy, and he’s already building working spaceships. (P4) So going to Mars raises three questions: (1) Can we do it? (2) Even if we can do it, is it too hard? and (3) Even if we can do it, and it’s not too hard, is it worth the trouble? (P5) The answer to question one is “yes.” We can send people to Mars. We already send robots to Mars, and have done this so often that it’s barely even NEWSWORTHY. (P6) The answer to question two depends, to some degree, on what “too hard” means. Regis talks a lot about the personal DISCOMFORTS involved in a Mars trip, but exploration is always difficult and uncomfortable. People who like ease and comfort should stay home. (P7) As for question three, well, that’s the easiest. Yes, it’s worth it. If human beings become a multi-planetary species, we become harder to wipe out. If Musk’s ultimate goal of a million colonists living on Mars in a SELF-SUSTAINING way BEARS FRUIT, then even CALAMITIES that would WIPE OUT life or civilization on Earth, like a major nuclear war or ASTEROID impact, will no longer be EXTINCTION-level events. That’s a pretty big deal. (P8) But I think there’s an even bigger reason to settle Mars: Earth civilization has become boring and INBRED. Back in the 1960s, people talked about the development of a “GLOBAL VILLAGE,” but village life can get AWFULLY STAGNANT, especially when there is nowhere else to go. A Mars society, developing at a distance from Earth and in a different environment, would bring useful diversity to human culture. (P9) So, CONTRARY to Regis, I think a Mars colony would be a great idea. Do you think that, 20 years from now, there will be colonies on Mars or the moon? 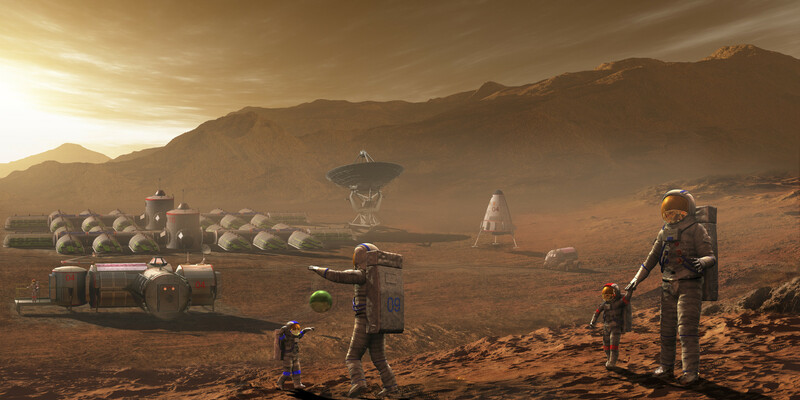 Do you think that a Mars colony could survive for a long period of time without receiving supplies from Earth? What sort of people would be attracted to the possibility of living in a Mars or moon colony? Do you agree with the CONTROVERSIAL statement that “Earth civilization has become boring and inbred”?